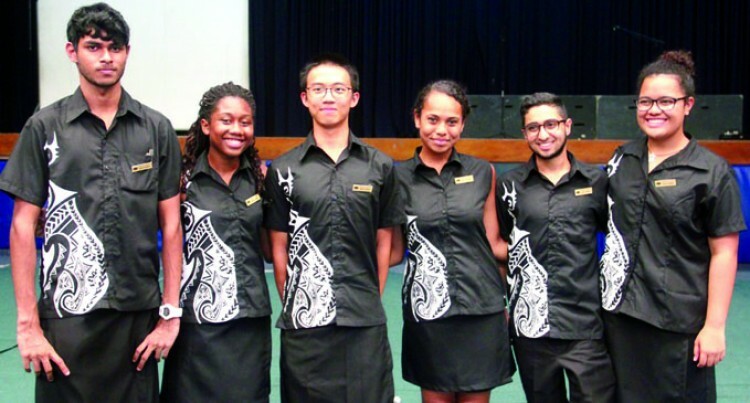 The International School Suva (ISS) yesterday inducted six student leaders for its secondary school. It is a new concept which will see the leaders, all Year 12, working together daily in helping teachers. Damien Raju, Chuan Yuan Liu, Arjun Bhugra, Amelia Kami, Adubi Plange and Alena Waqainabete were inducted by chief guest, David Dugucanavanua, an officer of ANZ Bank. Last year, the leaders campaigned for their election where they told the school why they should be elected as the school heads. The students cast their votes online until the end of last October. Alena, who is from Lau said: “Being a leader for me means to serve more than anything and that the badge is an extra accessory. Amelia is from Tonga. She gave credit to her late elder sister, Tae Kami, who died of cancer at the age of 15. Tae made an impact on so many people’s lives through her vision and dreams to build hospitals and get resources to help children suffering from cancer. It led to the setting up of WOWS Kids Fiji (Walk On, Walk Strong) which advocates on cancer. “We came up with the WOWS Foundation which all came from her dream and is known as WOWS Kids Fiji. It helps children with cancer and other life threatening diseases. “This leadership role isn’t about me, it’s about everyone else around me. If I believe in something it’s always good to step up and speak about it,” Amelia said. Adubi, of Fijian and African descent, was born in Australia but spent most of her life in Fiji. She felt proud and privileged to be selected and thanked her parents for motivating her. “I hope I can bring my tradition and culture and implement it to my leadership as both cultures advocate trust and independence. I feel everyone can come together as a family and make ISS a better place to be in,” Adubi said. Damien, who has maternal links to Taveuni and Rotuma, acknowledged his friends for their encouragement and support. “I want to be the kind of person to inspire others and let them know you as an ordinary person can do great things. I want to address the importance of allowing us to get involved in decision making as leaders. We are meant to work,” Damien said. Chuan, also known as Kevin, is from Hunan, China. He said he wanted to make a difference. “I know we can make a difference as student leaders,” he said. Arjun’s parents are from India, but he was born in Bahrain in the Middle East. He arrived in Fiji in 2014 with his family. “Even though we are leaders, the students voted and they want us to be their voice to get a change around the school. It’s not only about being under the lamp light, but it’s about serving,” Arjun said. Mr Dugucanavanua highlighted to the heads the five aspects to leadership. “Be a caring person, a good listener, a servant leader, an ambitious person and always be strong in your leadership role,” Mr Dugucanavanua said.